On your next visit to Ashburn House in Gladesville, make sure you stop in the waiting room across from reception to see the Gratitude Tree. All the ornaments on this tree were hand-made by residents during the Creative Art & Play class. The sessions, led by art therapy students Kate Jensen and Mara Lyone, are part of a 10 week art therapy program at Ashburn House. 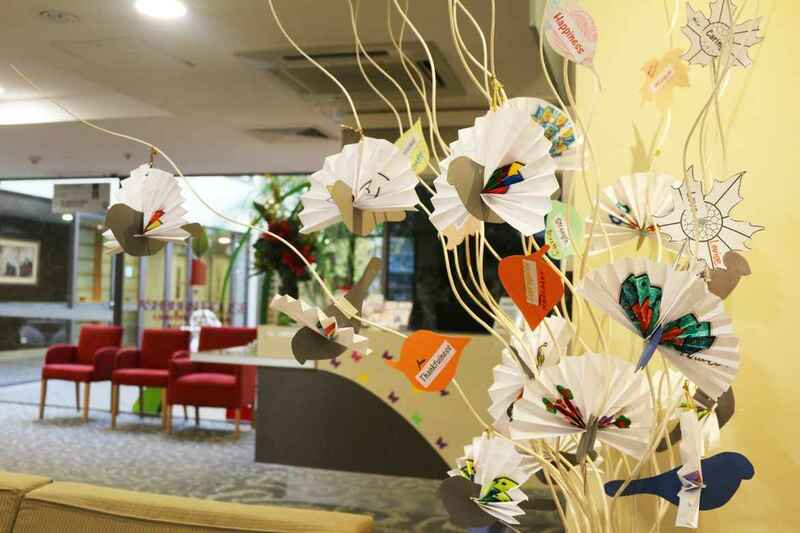 Every fortnight, up to 18 residents join in and use their creative skills to make meaningful works of art such as the Gratitude Tree. The Gratitude Tree branches hold cut out leaves featuring words chosen by residents about things they are grateful for. The bird wings are hand coloured folded mandalas, just like the ones in adult colouring books used for practicing mindfulness. During other sessions, residents have used the art of collage and painting, listened to relaxing music and heard poetry. Each session is carefully prepared and created for the residents to develop new creative skills, experience something exciting, reflect upon positive things, and have fun. Kate Jensen and Mara Lyone are Transpersonal Art Therapy students currently studying at the College of Complementary Medicine. “I love to connect with the residents while practicing art skills, and focusing on positive and relaxing thoughts,” said Mara. Kate holds a Master of Arts degree in psychology from Sydney University. “The things I love most about art therapy at Ashburn house is listening to the residents’ stories and the wisdom from their lives lived,” she said.